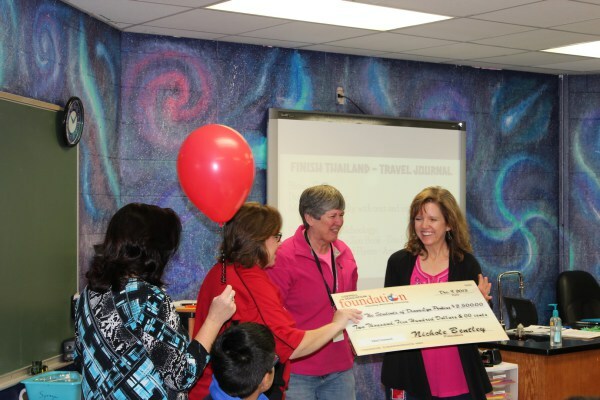 Coppell Middle School East's DianaLyn Perkins received $2,500 for "We Connect." This funded an iMac station for 6th and 7th grade science classes to allow them to participate in a collaborative effort with learners from across the world. In 6th grade they participated in the #twima3 (The World is My Audience vol. 3) project, joining with students from around the world to create a published iBook about patterns. Participating in this project increases the rigor of the student's experience as they look beyond the basic understanding of “patterns” to see patterns in science concepts and events. In 7th grade, students wrote an iTunes U course on human space exploration. Both projects require high quality video production to improve the standard of student creations. The iMac station enables them to combine their iPad creations with the robust abilities of the iMac station to produce a high quality final project to demonstrate their learning for both projects.